This Spanish almond cake is a vegan version of the traditional Tarta de Santiago from Galicia. This cake is easy to make with minimal ingredients and a clever egg substitute. Decorated with the Cross of Saint James and served with Spanish moscatel (or other sweet liqueur), this vegan Spanish almond cake makes a great dessert to a holiday or a regular weeknight dinner! Tarta de Santiago usually has just three basic ingredients: almond meal, sugar and eggs. This makes it a difficult recipe to veganize as no one egg substitute provides both the structure and leavening that the eggs perform in the original recipe. My husband is Spanish and Spanish almond cake is one of his favourite desserts. I’ve been puzzling over how to make a vegan version of it for literally years. There are very few vegan recipes online and they are all basically adapted versions of carrot cake requiring some kind of plant milk and copious amounts of oil or margarine. I wanted my tarta de Santiago to be more simple, less greasy and truer to the original. Enter my new favourite egg substitute: aquafaba! Aquafaba is simply the cooking water of garbanzo beans. When garbanzo beans are cooked, the release proteins which thicken the cooking water to the consistency of an egg white and allow it to be whipped into a meringue just like an egg. (Another great use for aquafaba is to make mayonnaise like this Spanish garlic aioli). There are two ways to get aquafaba. The easy way is to open a can of organic, unsalted chickpeas and drain it. That liquid is aquafaba ready to use. The longer way is to cook dry chickpeas from scratch, then reduce the cooking water to reach the consistency of egg whites. The second way guarantees that there are no added preservatives in the aquafaba but the results are less reliable as it can be easy to under- or over-reduce it. While aquafaba looks and whips up very similarly to egg whites, it does not behave exactly the same as eggs in baking recipes. It does not provide lift nor does it solidify. That means that it’s still necessary to add baking powder for leavening and flour for strength to the recipe in order to make a Spanish almond cake. What the aquafaba does, however, is add airiness and moisture to the cake without the need for large amounts of oil. So to make this Spanish almond cake you simply combine the dry ingredients in one bowl and whip the aquafaba in a separate bowl until you get firm peaks. Adding in lemon juice helps to stabilize it. Gently fold the dry ingredients into the whipped aquafaba and transfer to a baking pan. Bake for 30 – 35 minutes and it’s done! 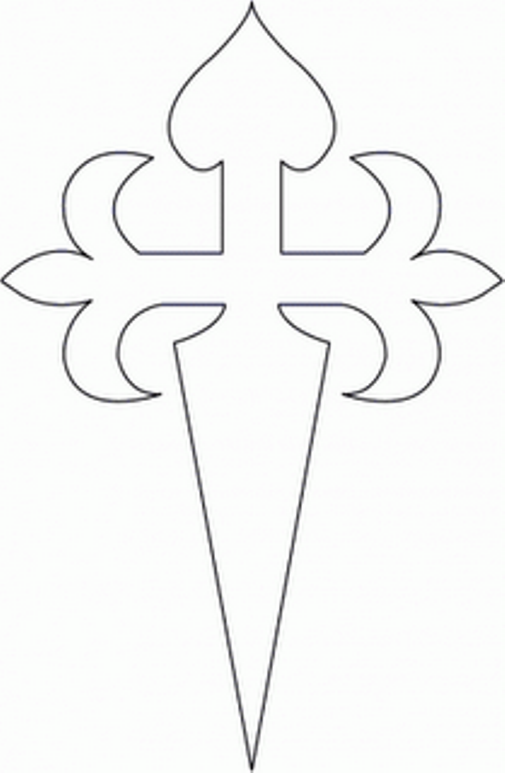 Tarta de Santiago is usually decorated with the Cross of Saint James. You can find a stencil online to cut out and place on top of your cake (I used this one). Sift over a bit of icing sugar and carefully remove your stencil. Serve your Spanish almond cake with shots of Spanish moscatel, or any other fortified wine or sweet liqueur. You’re meant to pour the shot directly over your slice of cake before eating it (don’t look at me like that, just trust me and do it!). This Spanish almond cake is a vegan version of the traditional Tarta de Santiago from Galicia. Decorated with the Cross of Saint James and served with Spanish moscatel. Preheat the oven to 120°C / 250°F. Spread the almond meal on a baking pan and toast it in the oven for about 5 minutes or until lightly golden. Watch it carefully because it can burn in a second. Raise the oven temperature to 175°C / 350°F and prepare a 15 cm (6 inch) cake pan by greasing the sides and placing a circle of baking paper on the bottom. Combine the toasted almond meal with the flour, sugar, baking powder, and baking soda in a bowl. In a tall bowl beat the chilled aquafaba with an electric beater until you reach soft peaks – about 2 minutes. Add in the lemon juice and continue beating until you reach firm peaks – about 3 minutes more. With the beaters running, slowly drizzle in the oil and beat for 1 minute more. Finally add the lemon zest and almond extract and beat for a few more seconds to combine. Pour the dry ingredients into the aquafaba and gently fold it in until no dry patches remain. The aquafaba will deflate a little bit as you do this but try not to overwork it in order to maintain the airiness. Transfer the batter to your pan and smooth it out. Bake for 30 – 35 minutes or until a toothpick inserted into the middle comes out clean. If the top is browning quickly, cover it with aluminum foil (I covered mine after 10 minutes in the oven). Allow to cool for 10 minutes in the pan then gently turn the cake out of the pan onto a plate. Allow to cool. When you’re ready to serve, place a stencil of the Cross of Saint James (available online) on top and sift over a fine layer of icing sugar. Gently lift off the stencil. Serve each slice with a shot of Spanish moscatel. Pour the shot directly over the slice before eating. *Check the Barnivore website for a list of Spanish moscatel wines that are vegan friendly. Recipe adapted from Hot for Food’s vegan hazelnut torte. November 9, 2017 at 6:33 pm Does gluten free flour sub well in place of all purpose flour in this recipe? November 13, 2017 at 9:08 am I have no idea, I don´t cook gluten free. December 15, 2017 at 5:27 pm I used Arrowhead Mill's gluten free all purpose and it worked well. Of course I can't compare to what it would have been like with regular flour, but mine was a little chewier than I remember gluten-full, non-vegan St. James being a few years ago. Super delicious, and a hit with the party I just took it to! December 16, 2017 at 12:54 pm Oh great, so happy it worked with gluten free flour. Thanks for testing it out! November 14, 2017 at 4:47 pm This sounds a lovely recipe thank you for sharing - is almond meal the same as ground almonds ? July 19, 2018 at 12:59 pm Great! So glad the recipe worked well for you! July 28, 2018 at 12:51 am I want to try this recipe, just recently a Spanish friend taught me how to make her dad's almond cake but wasn't a vegan recipe... If I have almond flour, how much of it should I use? Thanks! July 30, 2018 at 5:36 pm I *think* almond meal and almond flour are interchangable. Perhaps check on google if that's true or not. July 30, 2018 at 5:37 pm I *think* almond meal and almond flour are interchangable but please check on google if that's the case.